Karla Krengel, owner of Krengel and Hood Associates, enjoys helping her dealers find creative ways to bring out their personality and build on their brand. Karla offers a couple more ideas to have fun with. Karla says, “We shot these images the first week of November, so we grabbed some décor reflective of the upcoming holiday and used it to set a festive shot of Jaclyn “studying”a Thanksgiving cookbook. This makes for an original post for Thanksgiving on social media, Jaclyn could also make a greeting card out of it to send to industry partners thanking them for their business (I’m a big fan of sending thank yous at a holiday other than Christmas) or she can send a postcard to potential clients mid-Summer (yes, you read that correctly) suggesting they start the remodeling process now to be ready for the holidays! Note: Jaclyn brought a couple of different outfits for the shoot that day. on a note of congratulations to an industry partner. 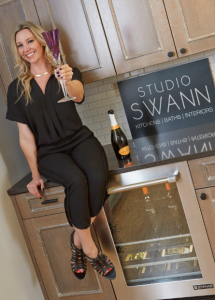 So, get creative, have fun – don’t just take pictures of a beautiful kitchen or bath or built-ins – put YOURSELF into the picture – with your LOGO – build your brand. It is your business, it is your work – show it off!! More to come – watch for it.